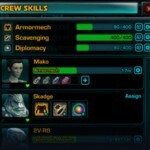 Players will have three crew skill slots to fill with any combination of Gathering, Crafting, Mission skills. However, a player may not fill more than one slot with a crafting skill. This will force specialization and make sure that players are not self-sufficient when it comes to crafting. Companion bonuses to skills are currently mild so that players will not feel they can’t take companions out on the field because they are too valuable on the ship taking advantage of their bonuses. Only companions do the actual crafting. You will not see anyone’s companions running around completing their assigned tasks. Devs are working hard to make sure crafting has a place in the economy, especially at end game, especially for devoted crafters. Devs are working hard to create a system in which some crafters become so skilled that they become renowned on the server for certain items. Go to Dev Tracker posts and read full posts by Damion Schubert here.